The restaurant just asks that for any online orders you use the code “FUNDRAISER”. And in the restaurant, they ask you to verify that your check includes the code. Reminder, funds raised by the Friends support programs for all ages and passes to many museums and venues. You can check out the Chateau’s menu and restaurant details here. *Note: The 20% applies to the “before tax” portion of the bill. My preference for donation would be to understand what the library initiatives are and contribute toward them directly. Not to downplay this initiative… but I’d rather give 100% (and skip the meal). 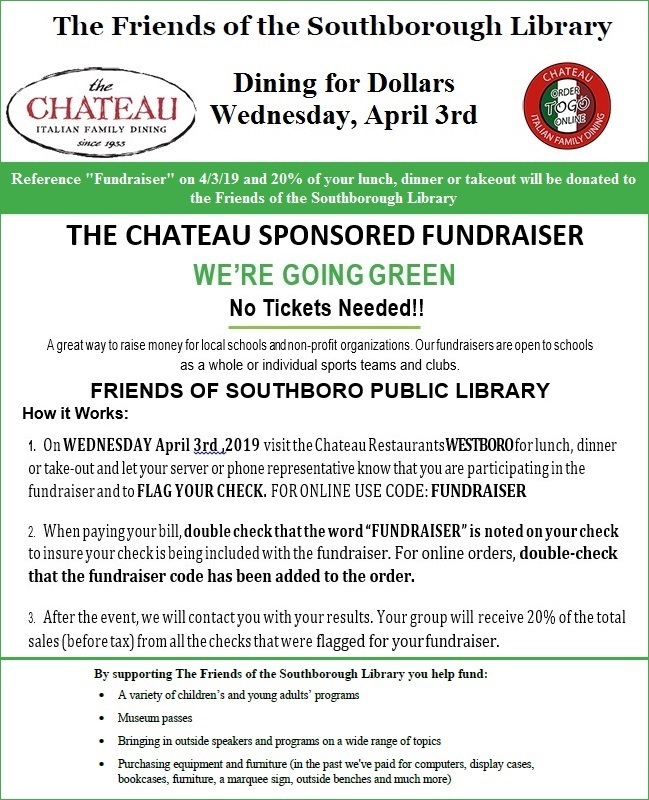 That fund is still active, but it is used differently than the Friends of the Southborough Library funds. The fund you are sharing a link to goes to a fund controlled by the Library’s Board of Trustees and intended for capital projects like future renovations, etc. 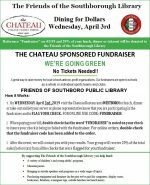 The Friends of the Southborough Library funds more immediate needs, like programming for children, YA and adults; museum passes; additional resources and materials, etc. Is there a way to donate more directly to FOSL? Didn’t see it on the Library site. Unfortunately, we don’t have a website set up for donating online. I guess it is something we should talk about setting up. Just to clarify – you did see that you can send a check, correct?